With the hundredth anniversary of the First World War upon us there will no doubt be hundreds of performances and productions linked to that terrible conflict. 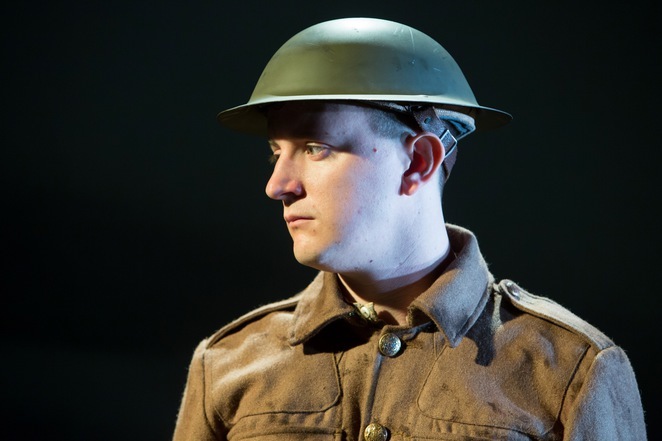 But I would be surprised if many have the same poignancy as this play which features just one actor who, facing death at dawn, recounts his life story. Private Peaceful is based on the First World War children's novel by Michael Morpurgo and it is as tragic as it is simple. We don't have any huge battle scenes, there aren't a host full of actors and the special effects are non-existent but it is Tommo's story which hits our hearts. Tommo is in his last night of life. When dawn comes he is to be shot for cowardice but, before we make any judgement, let's hear his story. The success of this show lies largely with the strength of the actor playing Tommo as he is alone on stage throughout the full hour and 40 minutes (and remains on stage during the interval). Andy Daniel is a wonderful Tommo. He is charming, funny, sweet and thoroughly likeable. He admits to his own flaws but has some solid values. He works hard, he loves his family, he is loyal – and he isn't a coward. Daniel succeeds in keeping the monologue lively, taking on the role of other characters from his mum stitching while she learns a family scandal to the over-zealous Sergeant Hanley whose decisions prove fatal to many. The subtlety of the show is what engages us. There is one set throughout – Tommo's bedroom – and yet clever use of lighting and a handful of props can turn it from a childhood schoolyard to the killing fields of Flanders. There is pure poetry in much of the monologue. As Tommo recalls how he loved playing in the mud as a child we make the mental comparison to the soggy trenches and as he talks of an elderly woman accusing him of cowardice for not signing up we see in her the bigger finger which will be the British Army who again accuse without understanding his story. Throughout there is the strong bond between Tommo and his two brothers, particularly Charlie, his older brother who fought for him in the school playground and now stands by him at the Front. For those who know the book there may be a surprise at the end as Simon Reade, who has adapted and directed the production, has made a bold decision to change its ending. In some ways that is a bit disappointing but to those who don't know the original novel it won't make any difference. And it certainly doesn't alter the message intrinsic in the story – that too many young men were accused of cowardice and desertion and shot at dawn. Private Peaceful is the perfect example of the idea that 100 deaths is a statistic but one death a tragedy. As Peaceful counts down the hours and we hear his story, we can't help but feel sympathy for him. Here is a boy who was too young to sign up and yet did so, whose loyalty to his brother overrides all and whose fate just doesn't feel fair. It is a powerful message. Bringing an entire conflict down to one person allows us to connect with all those who fought and died through this one 'everyman'. As the story ends and Private Peaceful goes to his death, we see not just one person's life lost but that of an entire generation. It's a powerful image from a simple yet highly memorable production.